Whether you are an adult seeking orthodontic care at Papandreas Orthodontics or your child is beginning the road to orthodontic care, you can rest assured that only the latest in technology is used to give you precise results. Papandreas Orthodontics takes advantage of one of the latest advances in the field of orthodontics by using the iTero Intraoral Scanner. This means avoiding the use of X-rays as this highly effective scanner uses a handheld device to scan a patient’s mouth and map out a plan of action for treatment. It is most commonly used in combination with Invisalign treatments as Dr. Papandreas uses the Invisalign Connectivity feature. This specialized scanner can be stationed next to your chair, or your child’s, after a scan has been performed, making it possible to see a representation of the teeth before and after treatment with Invisalign. When the results are visible and you know what you can expect from your orthodontic treatment, it makes it much easier to accept the road ahead. A set of beautifully aligned teeth is worth the wait. Invisalign treatment consists of the use of clear aligners that are made from medical-grade plastic. 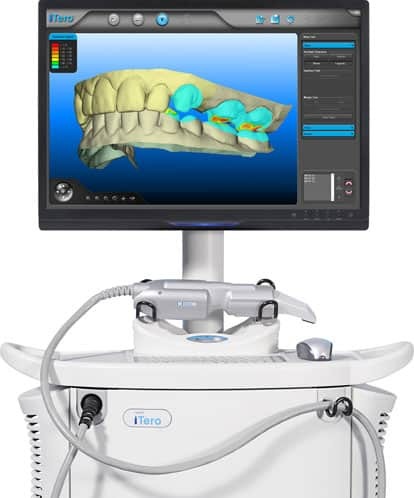 After using the iTero scanner and 3-D imaging, Dr. Papandreas will have aligners created for you that are tailored to fit your mouth, or your child’s. Every two weeks, a new set of aligners is worn as the teeth are gently shifted into the proper position. The length of treatment time and cost is comparable to traditional braces. Best of all, Invisalign is practically invisible. No one needs to know that orthodontic treatment is underway. The aligners can be removed during contact sports, special events, and to perform a thorough, oral hygiene regimen each day. Many patients find Invisalign to be one of the most convenient ways to achieve orthodontic correction. It’s recommended to wear the aligners for at least 22 hours a day to achieve the best results, but patients can avoid mouth irritation and don’t have to feel self-conscious while wearing their aligners. If you are an adult and you have put off orthodontic treatment, or your teenager is in need of attention, now is the time to visit Dr. Papandreas and find out how Invisalign can help you. See Invisalign in action with help from medical imaging. Dr. Papandreas is dedicated to helping patients to achieve the best in oral health, and that means having teeth that are properly aligned. When the teeth are in the right position, they will be healthier teeth that will benefit you or your child in years to come. Call now at: Brunswick: 330-558-9092 – North Royalton: 440-582-8585 or complete the convenient online form to set up your first consultation. With Invisalign, and many available options, you can expect results with help from the team of professionals at Papandreas Orthodontics.